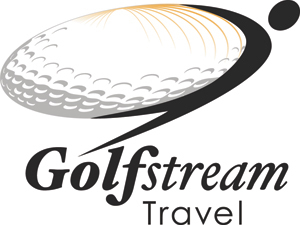 Surrounded by spectacular mountains and managed by Troon Golf, this unique Chandler golf venue is also home to the PGA's Nationwide Insurance Tour, Gila River Golf Classic held every year in October. The two Chandler courses, Devil's Claw and Cattail, are masterpieces developed by Gary Panks that will impress and challenge golfers of all skill levels. Covering 242 acres, with 92 acres of turfed area and 150 acres of desert landscape, Panks' design is "challenging but fair" for players of various handicaps. 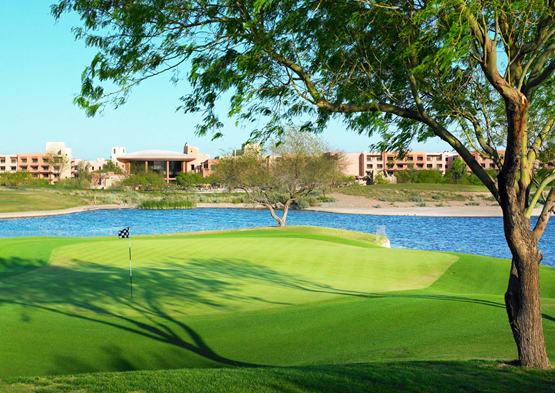 Each of the 36 holes is named after a significant legend or landmark of the Pima and Maricopa Indians. Only plants that are indigenous to the Gila River and its surrounding desert are featured on these 7,017-yard, par 72 Chandler golf courses. Both Devil's Claw and Cattail were created to reflect the land while the waters still flowed on the reservation by combining the Gila River landscape including Cottonwood, Mesquite, Saguaro and Palo Verde trees with native grasses and rolling terrain. These challenging Chandler golf courses also feature gradual elevation changes, great bunker designs with multi-tiered greens. And when your golf round is over, be sure to visit Sivlik Grill. The new clubhouse restaurant offers a unique dining experience including creative cuisine, picturesque desert views and mountain vistas. 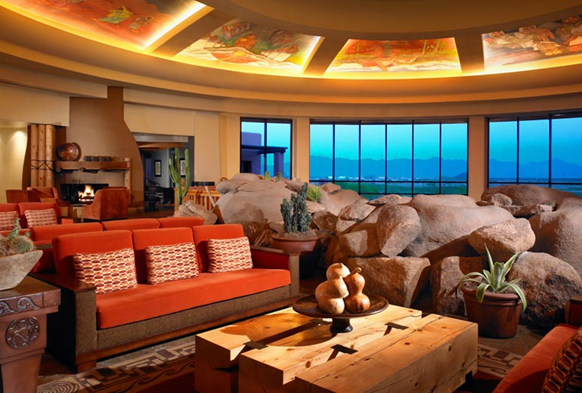 Our Phoenix accommodation is inspired by the culture and beauty of the Pima and Maricopa Indians. An interior designer's masterpiece, each detail in our 500 guest rooms has been included for cultural significance from the Pima and Maricopa traditions—from the design of the tiles and bedspreads, to the petroglyph-engrained furniture. Each room also offers authentic prints of artwork indicative of each tribe's cultural influence. Our Chandler accommodation features bath suites with separate tub and shower. Enjoy panoramic views including the Sierra Estrella and South Mountain Ranges, the Gila River and our two championship Chandler golf courses from your private patio or balcony. You may even see the wild horses roaming across the desert. Aji, meaning "Sanctuary" in the Pima language is appropriately named after the nearby Aji Mountain located on the Gila River Indian Community where women and children would go in times of war. Aji Mountain is still one of the Community's most sacred treasures and fittingly, Aji Chandler Spa is where sacred Pima and Maricopa traditions are practiced and shared. A true destination resort, the Sheraton Wild Horse Pass Resort & Spa offers several Chandler restaurants to meet any need and please any palate. Experience a one-of-a-kind cultural culinary journey at Kai, our Forbes Five Star Award and AAA Five Diamond Award Signature Restaurant; enjoy Southwest/American cuisine for breakfast, lunch or dinner at Ko'Sin; snack on tasty light fare at our Lobby Bar; lounge by the pool with menu options from Hanyo Grill; visit the nearby Sivlik Grill at the Whirlwind Golf Club or tempt your taste buds any time of day or night with 24-hour room service. Kai, meaning 'seed' in the Pima language, is a Chandler restaurant featuring a menu rich in creativity, history and Native American culture. Chef de Cuisine, Joshua Johnson, incorporates the essence of the Pima and Maricopa tribes and locally farmed ingredients from the Gila River Indian Community to create unforgettable masterpieces. Kai is open for dinner Tuesday through Saturday, reservations are strongly recommended. Ko'sin, meaning 'kitchen' in the Pima language, features a fusion of Native American and Arizona comfort food. Offering locally driven breakfast, lunch and dinner we know that every meal is important. Enjoy chef-crafted dishes amid stunning views of the Sierra Estrella Mountain Range in a casual setting. Light bites and signature cocktails are found in this perfect retreat set beneath a cascading waterfall and featuring unparalleled views. The Starbucks® branded coffee bar located in the lower lobby offers a variety of morning snacks as well as your favorite coffee and natural drinks. Link Café is open from 6:00 a.m. to 10:30 a.m. Monday through Friday and 6:30 a.m. until noon Saturday and Sunday. Truly an oasis in the desert, Hanyo, meaning 'oasis' in the Maricopa language, is set among the spectacular swimming pools and the recreated Gila River. Our Aji Café offers a menu with healthy lunch options prepared on site by the Aji Café Chef. Lunch is available Sunday � Thursday from 11:00 a.m. to 3:00 p.m. and Friday � Saturday from 11:00 a.m. to 4:00 p.m. 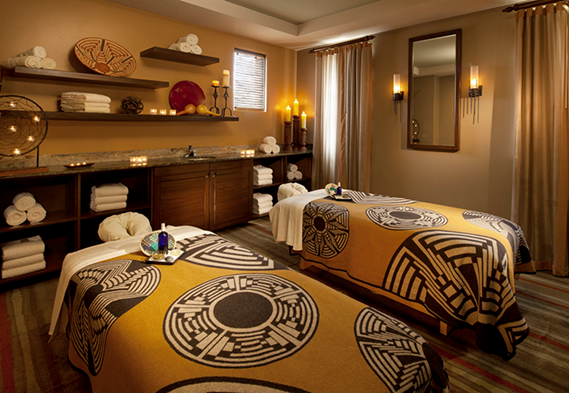 The Sheraton Wild Horse Pass Resort & Spa was designed to be an authentic representation of the Gila River Indian Community's heritage and culture. 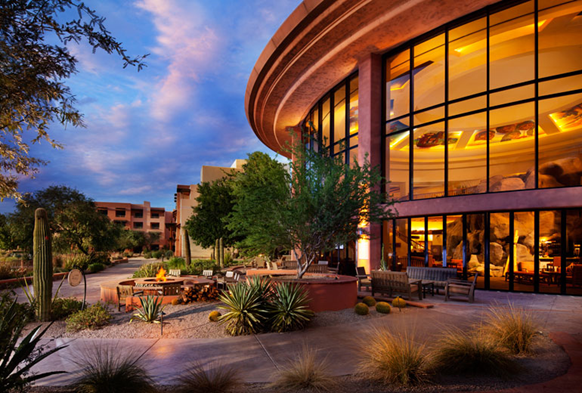 The architecture, design, art and legends of the Pima (Akimel O'otham) and Maricopa (Pee Posh) tribes are celebrated in every detail at our Chandler hotel, indoors and out. The Sheraton Wild Horse Pass Phoenix Resort & Spa was designed to be an authentic representation of the Gila River Indian heritage and culture, the Chandler resort will offer its guests a recreational, educational and inspirational experience never before available in a resort setting. The architecture, design, art and legends of the Akimel O'otham and Pee Posh tribes are celebrated in every detail imaginable, indoors and out. The resort is located in the high Sonoran Desert on an expanse of rugged Arizona landscape where the ancient vistas, mountains and roaming wild horses remain untouched. A unique blend of two cultures, the resort offers the quiet serenity created by the ancient sages and native tribes who found haven here along with the high-tech hotel expertise of the Sheraton brand. The Pima Indians trace their roots to the HuHugam (Hohokam) who farmed the Gila River Valley from 300 B.C. to 1450 A.D. The HuHugam developed an extensive irrigation system of canals, still used today, which gave birth to farming in the desert. The Pima and Maricopa tribes were hospitable and friendly, welcoming settlers and transforming a hostile territory into a temporary sanctuary...just as they continue to do now with the Wild Horse Pass Resort. Located just off the I-10 freeway on the 372,000-acre Gila River Indian Reservation, the resort is within minutes of the center of Phoenix and the East Valley and their many shopping, entertainment and recreational offerings. Phoenix Sky Harbor International Airport is only 15 minutes (11 miles) from the resort. 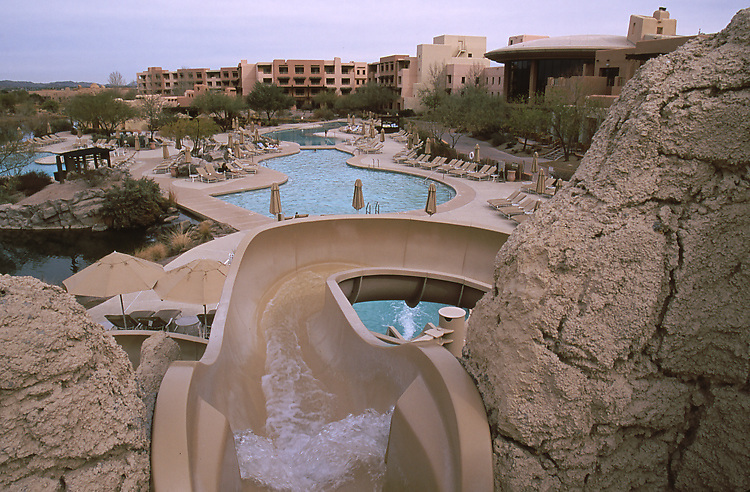 Experience a truly unique Phoenix Resort with a multitude of on-site activities in a spectacular setting.